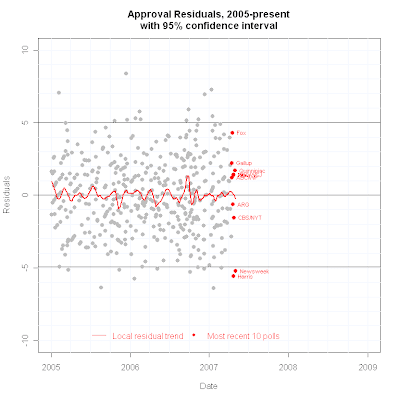 A Newsweek poll taken 5/2-3/07 finds President Bush's approval rating fallen to 28%, with disapproval at 64%. This is a new all time low for Newsweek polling on Bush and ties the lowest readings of Harris polls (taken 4/20-23/07) and an older CBS poll taken 1/18-21/07. 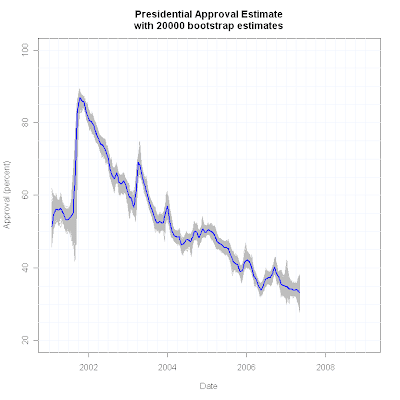 No poll has found a lower approval reading for the President. With the addition of this Newsweek poll, my trend estimate stands at 33.2%, also an all time low. 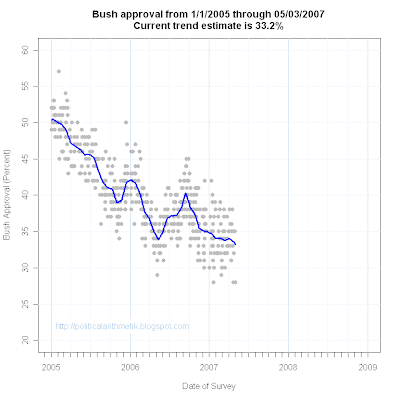 Before concluding that Bush's approval has crashed, however, the Newsweek poll should be compared to the recent trend and to other recent polls. The last six polls have registered approval at 35, 28, 35, 32, 35 and 28. So the last six readings are three at 35, one at 32 and two at 28, a seven point range. In the figure below, the Newsweek poll is clearly well below the current trend estimate, and more importantly, is below the typical Newsweek poll, which is normally about 2-3 points below the trend. The current poll is 5.2 points below trend. This means that Newsweek is a bit atypically low, compared to both other polls and to its own normal trend. 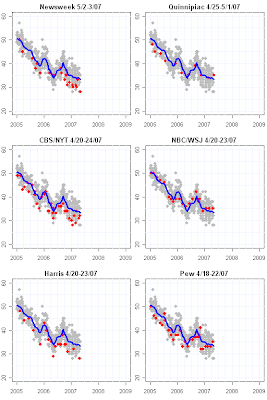 A check of the outlier analysis shows that Newsweek, like Harris 10 days earlier, is in fact an outlier when compared to the variation around the trend estimate for all polls. The Newsweek and Harris polls are exerting a significant pull on the trend estimate, even when balanced against the three recent polls at 35%. The current small downward slope in the trend estimate is due to the addition of Newsweek. It was flat prior to adding the new poll. The sensitivity analysis below shows how the last 20 trend estimates have moved around as each new poll has been added. the substantial effect of the new Newsweek poll is apparent in the gap between the current estimate and the previous cluster of estimates between 34% and 35%. The bottom line is that the evidence for a new decline in approval remains quite mixed, with two polls claiming a rather dramatic drop in approval, while several others suggest continued stability around 32%-35%. 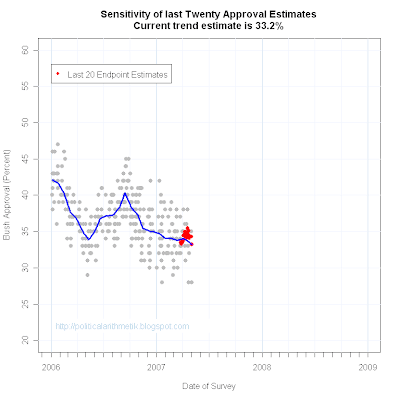 Given the outlier analysis and the fact that the Newsweek poll is clearly below that poll's own trend, we must still wait before concluding that approval has taken a sharp turn down. The evidence remains in favor of rough stability around 34%, though the trend estimate now stands a little below that, in deference to Newsweek's evidence.